The New York Festival of Song has made a triumphal procession around the bounds, dredged the rivers, and scaled the promontories of song for twenty treasurable years. In observance of their significant anniversary, they have — true to the gaily transgressive spirit of many of their programs — effected two important commissions, not of song but of opera. For one week only, they become the New York Festival of Opera. The chosen composers are so well-chosen as to seem almost inevitable. William Bolcom, the world’s most youthful grand old man of his craft, turns seventy this year. John Musto, who shares a distinct musical affinity with him, is a generation younger. They both are musicians of astounding natural gifts, are brilliant pianists, speak a wide variety of musical languages with fluency, and are married to extraordinary singers. The two operas by these two masters of orchestration in fact employ two pianos in place of an orchestra, piano being the normal accompaniment at NYFOS concerts. 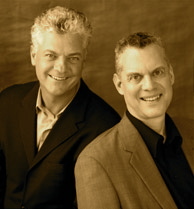 The pianos were manned by two other formidable musicians, the founders of the NYFOS, Michael Barrett and Steven Blier. Each opera is of one act, and together they make a full, satisfying entertainment. The word entertainment is used with deliberation here, since both these composers rejoice in and cultivate that rare ability: to be consistently diverting while doing so via only the most cultivated means. This also is appropriate to the NYFOS affect, which has strong roots in the artistic ethic of another artist whose birth anniversary we celebrate this year, Leonard Bernstein. Musto’s piece, Bastianello, came first. Based on an Italian folk tale, its hilarity leads to a deeply touching climax and culminates in an exhilarating moral, memorably presented. The style itself is a little difficult to describe with the usual cant of reviews. It shows an awareness of the whole sweep of music history, gracefully incorporating whatever is appropriate to the dramatic and formal moment. The “gracefully” there pays tribute to a complete lack of pastiche within a rare universalism. We hear a musical sophistication, involving complex structures, that carries itself with the nonchalance of folk music. It even sometimes brings Chopin to mind in this respect. While the Musto opera is continuous and never for a moment allows for applause (except the applause of spontaneous laughter and the eventual furtiva lagrima), there are set pieces in the Bolcom that demand applause à la Rossini. Or perhaps à la Sorazábal, since Lucrezia (though based on Machiavelli’s comedy La Mandragola) could easily be intended as a tribute to the many rich Hispanic nights that the NYFOS has given audiences over the years. It’s a kind of zarzuela, none the less original for its delicate bow to that idiom. In fact, with all its insouciance, one way in which it exhibits discipline is by staying within sight of the ethos of the tango throughout. I wonder: is this the first zarzuela in English? Anyone who knows Bolcom’s imperial musicianship (“imperial” both in its command and in its commandeering of whatever serves its purposes) will be unsurprised to hear that there is never an equivocal moment — nothing but a flow of gratification and surprises. It was affecting to note that Bolcom’s Lucrezia is “lovingly dedicated to the memory of Madeleine Milhaud,” the recently deceased widow of the master to whom his disciple William Bolcom is such a credit. Thus could associations of the evening extend back to Darius Milhaud‘s own operas, the first five of which were composed more than a hundred years ago. All the attributes of a singular success enumerated so far would have been wasted on a less than adequate performance. In the event we heard far, far better than that. If those rôles had been written specifically for the singers involved, the fit could not have been happier. I could descant extensively on the virtues peculiar to each singer but will instead just list each of them at the end with my pledge that each was perfect in his or her own way. I hope to have a good deal to say about two of them in subsequent postings. The redoubtable Leon Major directed the action on the small, setless stage with an ingenuity that managed to convey more than any but the most successful fully-staged productions communicate. There was nothing simple about the effects or the skill involved in producing them. In fact the acting mirrored much of the allusiveness of the scores, which is high praise indeed. That I have saved the librettos for last comment by no means betokens a lack of regard for their rôle. I propose to give it a place of honor, in fact. In Mark Campbell, these two composers have encountered a wordsmith who calls forth their best, which is precisely the accolade we give history’s best librettists. For Musto this is the third operatic collaboration with him. Bolcolm, who has famously worked marvels with the poetry of William Blake, had been deprived, through the death of the eminent Arnold Weinstein, of a collaborator with whom he had enjoyed signal success for many years — years that included his three large-scale operas and the whole corpus of his cabaret songs. Campbell brings a different frame of reference to his work, is a very different animal literarily from the quirkily Græco-Roman-oriented Weinstein, but is similarly inventive and careful of overall form. While I feel that his Later the Same Evening, written for Musto and premiered this past November, is even finer, both of these composers are right to delight in such a colleague who — like all worthy librettists — brought out in them what no other author would be likely to evince in comic operas like the ones that a grateful audience heard last night. C.S. Lewis once wrote that we are under no obligation to express our deepest emotions “in the world-without-end, heart-breaking manner of Tristan and Isolde; let us often sing like Papageno and Papagena instead.” I had lived through the trials, both intended and unintended, of a disastrous Tristan the very night before these premieres, but I feel certain that Mozart’s and Schikenader’s winsome couple would love to play in either Bastianello or Lucrezia, which are very much of their spirit. Enormous credit goes to the justly celebrated founders of the New York Festival of Song (Steven Blier now being the Artistic Director) and their creative Executive Director, Elizabeth Hurwitt, for bringing to being these two valuable new works. For those who did not attend the premiere, it may be possible to snare returned tickets for the second sold-out performance. But the operas will be given again on Saturday night the 15th at Caramoor. Attendance is strongly advised.